The University Honors Program celebrated its 45th anniversary in 2017, and nothing makes us prouder than our more than 2,000 graduates. Although most have stayed in Ohio, there are many living, working, and serving throughout the United States and around the world. The medical professions comprise the largest group: nurses, physicians in all specialties, pharmacists, veterinarians, and dentists. We have a large contingent of teachers, both K–12 and university professors. Our outstanding cadre of engineers are serving as both civilian and active-duty military. Our business students are keeping the economy humming in the Miami Valley and around the country. Among our liberal arts graduates are attorneys, therapists, arts managers, and many other professions too numerous to mention. 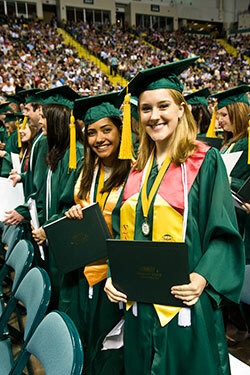 Many of our graduates are Wright State University employees. They are also parents, coaches, citizens, and community volunteers who, as a group, have achieved wonders. Many have been recognized by state and national professional organizations for their contributions to their fields. And it is both the small personal things and the major career achievements that we want to recognize. Send us your news and updates, and we will post them on the Honors Alumni News webpage.